Eight years after Batman took the fall for Two Face’s crimes, a new terrorist leader, Bane, overwhelms Gotham’s finest, and the Dark Knight resurfaces to protect a city that has branded him an enemy. BEFORE: The Dark Knight Rises will check off a few more milestones in this marathon. First film seen in theaters, first midnight release, and first sequel. 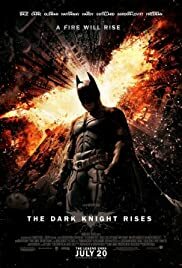 The Batman franchise is a special one for me as Christopher Nolan’s first entry into the series, Batman Begins, was the first superhero film I saw. Side note: If you are able to make it to a true IMAX screen, that is the ideal viewing experience as Nolan shot over an hour’s worth of footage on 15/70 IMAX film. You can read about true verus fake IMAX screens at one of these two articles. You can then search for theaters in your area and see what their IMAX screen size is. Sad to say that the closest true IMAX theater for me is about two hours away. AFTER: Billed as the “Epic Conclusion to the Dark Knight saga”, The Dark Knight Rises is just that; epic. The sheer scale of the film is enormous with the runtime clocking in at 164 minutes, the longest in Nolan’s trilogy. And you really get 164 minutes worth of entertainment. The film is jammed pack with action, conflict, and a whole bunch of new characters. Taking place eight years after the end of The Dark Knight, Gotham City is in a time of peace and Bruce Wayne/Batman (Christian Bale) is in exile. Until of course Bane (Tom Hardy) appears and sends Gotham once again into a state of terror and panic. And all of this happens within the first fifteen or twenty minutes setting the film up for much more to come. There were many parts of this film I enjoyed. Wayne/Batman’s journey, both physically and mentally, really connects with the previous two films and is a fitting way to show his progression from an orphan boy into who he is today. I particularly enjoyed when Wayne was in a place and had to make his way out. (How’s that for a nondescript, spoiler-free description.) The location not only looked great from a production design point of view, but it also served as a way to bring my favorite part of Nolan’s trilogy, Wayne’s story, full circle from Batman Begins. The film is also riddled with many great lines, one of my favorite being when Selina Kyle (Anne Hathaway) vanishes and Batman responds, “So that must be how it feels”. Blake (Joseph Gordon-Levitt) is one of the many new characters introduced and is by far my favorite. An all-around good job, from Gordon-Levitt’s acting to the character’s backstory and plot arc in the film. While The Dark Knight Rises is epic and has many great elements, it was far from perfect. I think the problem is Nolan tried to bite off more than he could chew; there’s just too much he tried to cram in to one movie. While Blake was a great character addition, Bane, Miranda (Marion Cotillard), and Selina Kyle were far from perfect. There were many things about the characters that were simply not explained and left me puzzled. Bane especially left me with a lot of questions. Where did he really come from, how is he so strong and powerful that Batman has difficulty against him, what is the deal with the mask and what happens if it’s removed? Some of these answers are alluded to in the film but aren’t fully explained and left me less-than-satisfied with the new villain. Miranda and Selina Kyle were decent characters and are close Blake’s level of awesomeness, but they had some puzzling questions I wanted answered. Without a doubt, The Dark Knight Rises will be one of the biggest films this summer, and for good reason. It’s a great spectacle filled with some great explosions, badass fighting, and The Bat which Batman oh so eloquently describes as, “This isn’t a car.” But there are just too many unanswered questions and plot holes. While in a film like Inception, leaving questions open for discussion and being ambiguous is a benefit, for a film like The Dark Knight Rises, where its strengths are well-developed heroes and villains and a story that’s easy to follow, the ambiguity only detracts from the entertainment value.